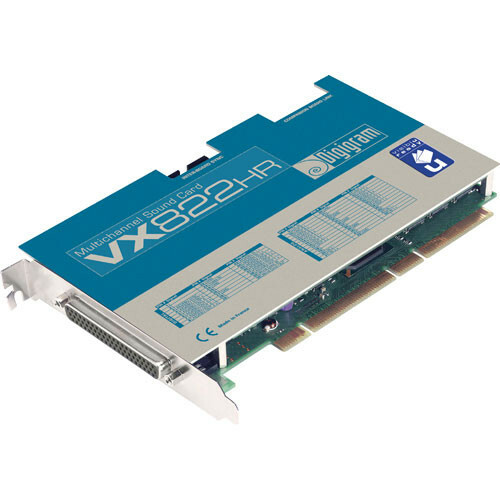 The VX822HR from Digigram is a short-form PCI card that provides 2 channels of analog or digital audio input while simultaneously outputting 4 stereo pairs of digital output or 8 mono channels of analog audio. Especially useful for broadcast live-assist systems, permanent playback and multi-channel playback, the card provides excellent audio performance with pristine sound quality and the ability to perform 24/7 in the demanding broadcast environment. Comprehensive synchronization options include AES/EBU input, Wordclock I/O, video sync and LTC input. The card is "visiblu" ready (a technology based on Digigram's Network Audio Operating System) and provides low-latency, wide area network (WAN) encoding and processing, whether the assets are located next door or hundreds of miles away. The VX822HR is the perfect solution for professional users working with software based on standard WDM DirectSound, ASIO, WAVE, or Digigram np interfaces. All connectors are available on an included 62-pin HD Sub-D breakout cable. Note: The digital outputs always play the digital version of the corresponding analog output. Selecting the AES/EBU input excludes the selection of the analog inputs. Box Dimensions (LxWxH) 14.0 x 6.0 x 4.0"